Expert advice, in real-time at your fingertips. 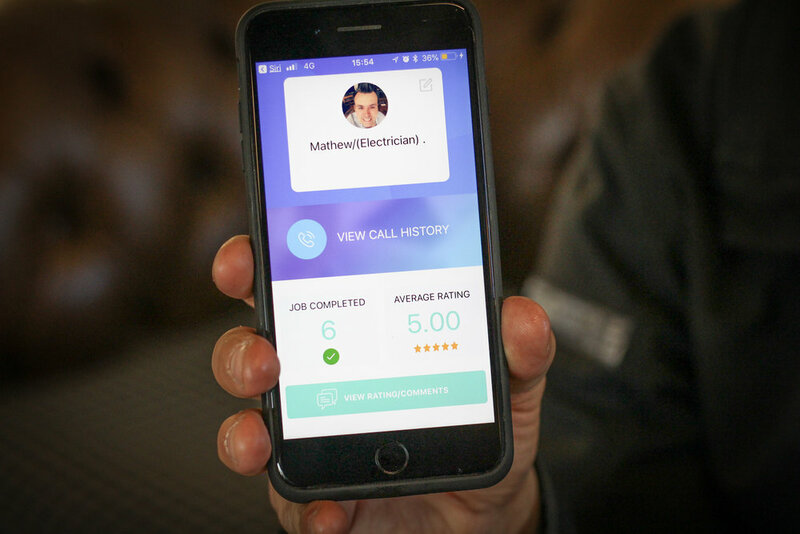 EHLP is a mobile app that combines video chat technology with live tutorials and walkthroughs to help users solve basic electrical faults within the home. We spoke with the man behind the new digital solution to discover how it works and how it could transform the way we learn and share skills. "EHLP provides you with a chance to get instant, expert advice at the push of a button," Matthew Trever, founder of the video app explains. "It allows the general public to quickly and safely resolve electrical issues, whilst enabling the electrician to work from home and on-the-go." "I spend a lot of time on my phone, trying to walk customers through simple solutions, whether it’s through a phone call or WhatsApp. One day, I thought: there's gotta be a better way of doing this!" And so the idea for EHLP was born. The user pays £1 for every minute of live help they receive, and the professional receives a percentage of this. The application reduces the need for tradespeople to travel to destinations for quick, straightforward jobs and therefore cuts down hefty callout charges. Meanwhile, if the issue is more complex, the electrician is able to quickly diagnose the problem via the video call and later turn up to the job equipped and prepared, saving everyone time and money. EHLP has arrived at a time when the DIY ethos is king and platforms like YouTube, Udemy and Skillshare are rising in popularity. "What makes EHLP different is the fact it's instant and it's live help. You get to chat with a real person who can answer any questions you have and speak with you directly. You're not trying to follow a DIY video or online course and wonder whether or not you've got it right," Matthew enthuses. "It's always safe too. We're not allowing anyone who is unqualified to deal with live wires - it's just to help people with standard faults, such as a blown fuse." Matthew is currently targeting the industry that he lives and breathes: electrics. However, EHLP has a huge scope to appeal to a wider skill-sharing community. "In the future, we really want to branch out. The possibilities are endless: any skill that people have can be shared through this app on a unique one-to-one basis." The way EHLP has been designed ensures that the person you're talking to knows their stuff, which further sets it apart from simply calling up an individual or watching someone's video tutorial. "Every EHLP expert can be reviewed and recommended by each of our customers, so it stays true to the tradition of word-of-mouth referrals that the building trade relies on." Being at the C4DI has empowered Matthew to discover more about digital, despite him working in a predominantly ‘traditional’ industry. "I've been attending CodePen for a while now and have learned a lot about development, software and technology. With skill-sharing at the heart of this app, I'm always keen to improve my knowledge." Matthew is currently speaking with maintenance companies, electricians and local authorities to see how they can become part of the blossoming EHLP community. If you would like to find out more information, please visit the EHLP website, or get in touch with Matthew info@ehlp.co.uk. In the meantime, if you have an incredible idea that you'd like to make happen, contact our Community Manager (dr@c4di.net) to see how we could work with you. Newer Post#ScaleUpHull: What’s All The Fuss About?